The processes and devices employed in narrative cinema are often times subsumed by the visual nature of the medium. This exhibition brings together artists whose work investigates the cinematic process; creating narratives adopted or appropriated from film and the cine-novel, the works allude to the underlying psychological aspect that is integral to the creation of tension within cinema. The artists deconstruct these approaches and open up new questions surrounding the nature of cinema. They demonstrate how the re-interpretation of a scene or dialogue can alter its meaning, exposing the structured layers of the cinematic process. 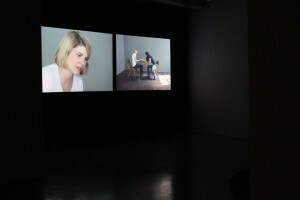 Kirschner & Panos Living truthfully under imaginary circumstances is a multi-channel video installation based on the acting techniques developed by Sanford Meisner, which remain highly influential on American cinema and drama. The technique emphasizes the importance of improvisation and creating a subtext through emotional responses. Intense repetition and observational feedback allows for the actors to recreate an authentic experience and emotional response in their performance. The method is based on theories of the ‘true’ nature of human behavior. This piece allows the viewer to recognize familiar methods in acting that once seen as radical are now formulaic in popular cinema and soap operas. The installation combines footage of young actors working with Meisner’s exercises and material from the history of theatre and cinema. Kirschner & Panos aim to interrogate the assumption of post-modern naturalism and its blurring of the distinction between dramatic artifice and seemingly ‘primal’, ‘human impulses’. Allan Hughes Point of Audition examines established functions of the recorded voice in cinema and its position of subjective authority that is essential to the connection between body and voice The two channel, synchronized video installation takes as its starting point the role of the tape recording device and the established access to self determination of the cinematic voice-over in the narrative of Alan J. Pakula’s Klute (1971). Hughes reconstructs one of the scenes with Bree Daniels (Jane Fonda) and the analyst and imposes vocal extracts from Fonda’s Radio Hanoi transcriptions. Jane Fonda’s identification with her character, Bree Daniels, in the film was deeply empathetic and in particular her understanding of the process of subjective authority that is intrinsically bound up with ideas of the relationship between body and voice. This was an understanding that she was concurrently engaging with in her own life as she protested American policies in the Vietnam War and specifically when she took the opportunity to ‘lend her voice’ to the anti-war movement by traveling to Vietnam and speaking out on Radio Hanoi in the summer of 1972. Here Fonda made a series of politicised statements given in protest to American involvement in the Vietnam War, infractions of the Geneva Convention and the policies of President Nixon’s administration. They were directed primarily towards U.S. soldiers based in Vietnam. 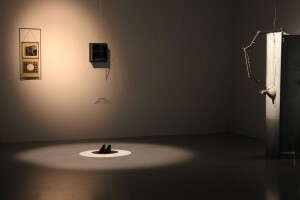 The works examines the function and effect of remediation on the voice and explores the consequences of establishing the voice as an object that is extra-linguistic to speech. The material aspect of the voice shifts between historical subjects, the work and the spectator. Allain Robbe Garillet’s novel Jealousy is the starting points for Laurence Kavanaghs sculpture Jealousy. The novel is a series of repetitive description of settings and objects that infer the psychology and interiority of the unseen narrator. 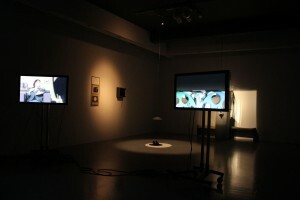 Kavanagh interprets these encoded cinematic descriptions and recreates scenes through a three dimensional sculpture. Constructed from everyday materials the sculpture plays with both the real and the imaginary, creating a set through which the viewer can recreate both the tension and the scenes that is present in the cine-novel. The meticulous attention to detail and the layering of scene on scene reflects the complexity of the text and the obsessive nature of the narrator. 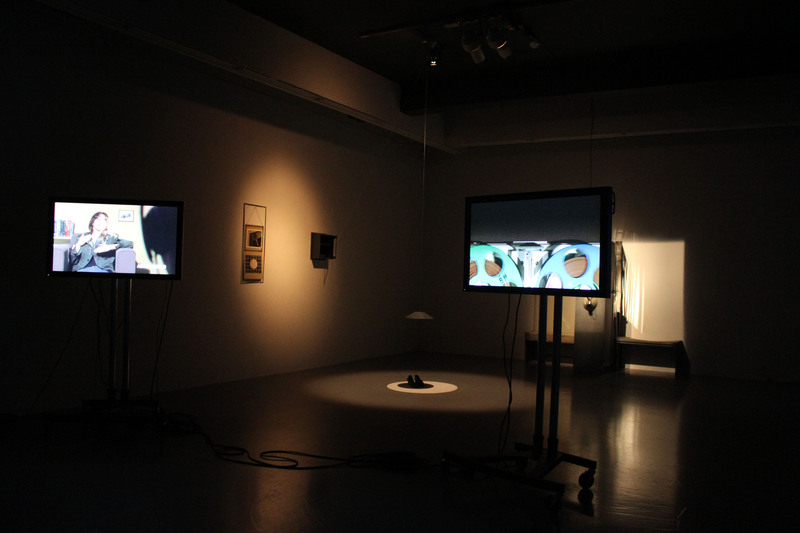 The presence of each piece within the darkened gallery space alludes to the cinema space as well as theatre. The exhibition identifies specific strategies used by artists to articulate their understanding of the role of cinema within both the historical and present context. This ongoing dialogue between art and cinema is constantly shifting and evolving, more so with the development and access to new technologies as well as to film archives. This has created an expanded framework and reference point from which we can extend our understanding of the moving image and its implications.